But last week when I arrived, something seemed odd. When the young narrator of this story visits her grandad, she does all the things she usually does – drinking tea, helping with the housework and gardening, feeding the cat and so on – but all the while, she can’t help feeling that something is different than usual. As the text describes what seems a very normal day, the illustrations show things which viewers will find anything but normal – from the giraffe in the front yard when she arrives, to the tea being poured from a watering can, and the cat, which is in fact a tiger in a highchair. Readers will love spotting these details and so very many more, but the biggest surprise will be in realising what it is that the narrator has sensed as different – Grandad’s odd socks. The fabulousness and eccentricity of Grandad and his house will delight, and the realisation that the girl has not overlooked all of this but has, instead regarded it as normal, is satsifying, leading readers to question and discuss what they are seeing, and versions of normality. The bright, detailed watercolour illustrations reveal more on each rereading. 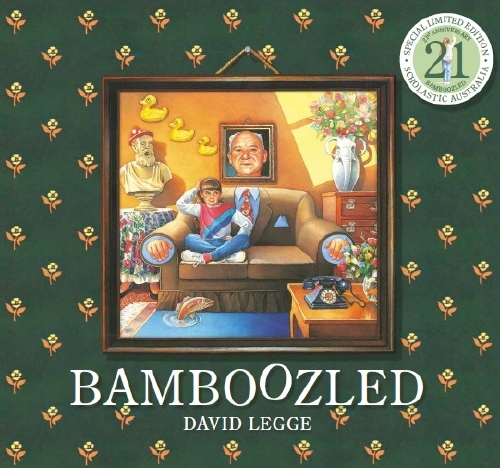 First published in 1994, it is lovely to see a new edition released to mark the 21st anniversary of Bamboozled. Kids love rhyme, and kids love silliness. These four little books offer a blend of the two in a combination sure to get them giggling, reading aloud and turning pages enthusiastically. Each book is forty-eight pages of rhymes long and short illustrated in colour by Peter Viska. There are rude bits, gross bits and even slightly shocking bits, and the cartoon style illustrations bring each rhyme to life. Likely to please primary aged readers, these would be a popular addition to school libraries. In Your Eye Meat Pie! Take a Stroll Sausage Roll!